Fiday 22 of March 2019 Pre-order will start for HEAVY LOAD “Death or Glory” Reissue! SACRED RITE debut album to be released in deluxe limited vinyl edition. RIOT CITY joined No Remorse Records for the release of the debut album "Burn The Night"
TWISTED TOWER DIRE "Wars In The Unknown" out now! 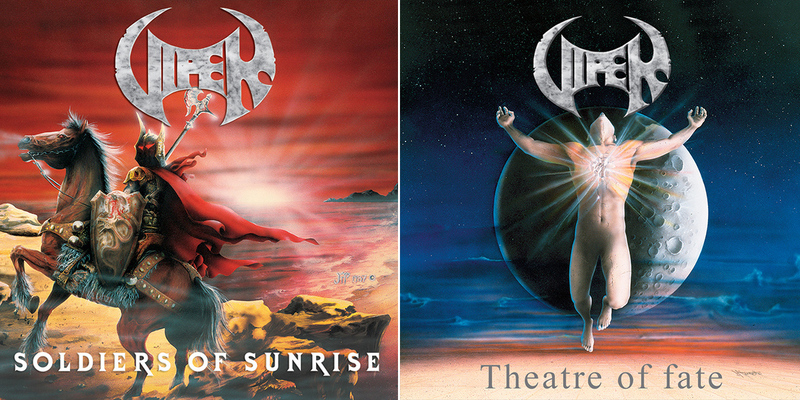 VIPER (Brazil) "Soldiers Of Sunrise" & "Theatre Of Fate" 2019 reissues! Reissue of the classic albums of VIPER (Brazil) featuring Andre Matos (ex-ANGRA) on vocals. Reissues of the classic albums of VIPER (Brazil) featuring Andre Matos (ex-ANGRA) on vocals. Originally released in 1987, "Soldiers Of Sunrise" is one of the greatest metal albums ever released in South America and a gem of '80s melodic speed/power metal. A classic '80s underground metal album full with heroic anthems, speed metal enthusiasm and youthful power. "Theatre Of Fate", originally released in 1989, has a more polished sound and is a highlight of melodic power metal of the late '80s. Both albums, are highly recommended for fans of HELLOWEEN, HEAVENS GATE, ANGRA and IRON MAIDEN. Free poster & patch for HEAVY LOAD pre-orders only! Update on available pre-order and latest No Remorse releases. Partner with No Remorse and earn up to 10% per sale! Please see this page for more information on our affiliate program.